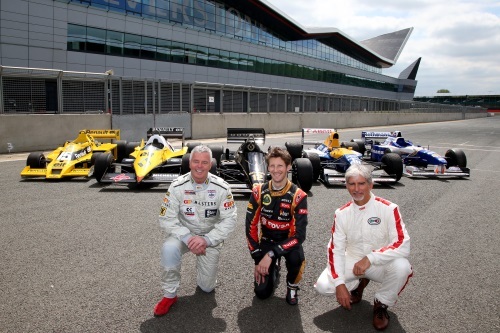 With just three races to go until the 2014 FORMULA 1 SANTANDER BRITISH GRAND PRIX (04-06 July), 1996 World Champion and 1994 British Grand Prix winner Damon Hill OBE, current Lotus F1 Team driver Romain Grosjean and Derek Warwick, former Renault Formula 1 driver and President of the British Racing Drivers’ Club (BRDC) were all at Silverstone on Thursday 15 May, looking ahead to this year’s event, which will be the 50th Grand Prix to be hosted at the Northamptonshire circuit. The assembled cars provided a real taste of what fans can expect to see at this year’s British Grand Prix. As part of the circuit’s ‘Silverstone50’ celebrations, a host of iconic British Grand Prix winning cars are being assembled to feature in three commemorative parades - one on each day of the event – and will be driven by some of the biggest names in British and world motor sport. Also present at Silverstone was Rob White, Renault Sport F1’s deputy managing director (technical), who was on hand to provide a wealth of technical information on the original turbocharged cars. An original 1984-1986 Renault EF 15 two-litre engine and Renault’s modern day Energy F1-2014 hybrid power unit, were also on display. Derek Warwick, President of the BRDC and works Renault driver in 1984 and 1985, commented: “Seeing these cars here today brings back many memories of the British Grand Prix. Silverstone is the home of motor racing no matter where you are in the world and it’s the most challenging circuit you’ll ever drive on as a racing driver. Racing in front of your home crowd makes you just that inch taller. You get lifted by the crowd as you go through the front gate, your heart rate goes up and it’s just amazing, you can’t put it into words. Other cars confirmed to be on display in a ‘Silverstone50’ Heritage Paddock at this year’s British Grand Prix include: Nigel Mansell’s 1987 Williams-Honda FW11b, and Lewis Hamilton’s McLaren Mercedes MP4-23, which he drove to World Championship glory in 2008. Sir Jackie Stewart is also confirmed to drive his 1969 British Grand Prix winning Matra MS80 in the commemorative parade.